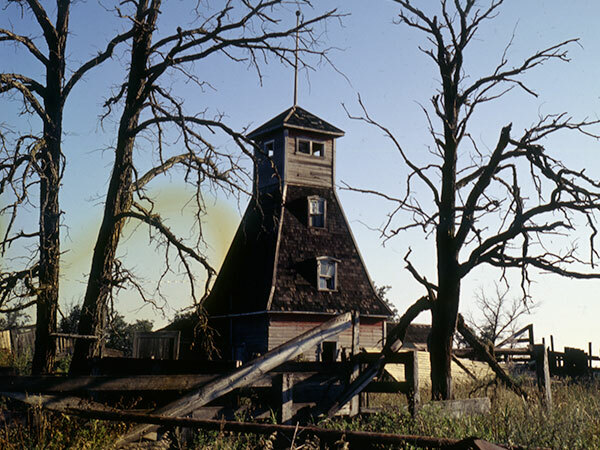 This tower near Stonewall, in the Rural Municipality of Rockwood, is one of a handful of surviving buildings used for fur farming in Manitoba. At the height of the industry in the 1930s and 1940s, it produced more than 25,000 pelts annually, usually of mink and fox. Around 1981, the building was featured in a Manitoba Co-operator series on rural architecture. The original caption for the photograph is given below. At the height of industry success more than 175 fox farms operated in Manitoba during the mid-1930s. Today, there are about five commercial fox fur farms still operating, although a number of abandoned fox towers reminder other generations of one of Manitoba’s most successful past farm commodities. This particular tower is a familiar sight to motorists on Highway 67 heading for Stonewall. Built about 1919 for the Langtry Fur Farm, it continued in use until the 1940s. Every year in late January or early February, fox ranchers would have to climb the towers to keep constant vigilance over breeding programs. Each morning a male fox would be moved into a female’s pen and if mating occurred he would be moved to another pen the next morning. If mating did not occur, he would remain. The breeding season ended about one month after it started. In the mid-1920s, top male and female breeding stock was being exported from the Langtry Fur Farm to Sweden for as much as $1,500 per animal. Fox pelts were fetching prices of up to $300 and $400 each, but fell to a low of $15 a pelt as overpopulation and markets shifted. This spelled the end of the instury as it was then known. The Langtry operation was originally started by Richard Langtry and in turn taken over by son Jim, and later by grandson Bud, who also introduced the operation into mink. Today there are fox farms at Arborg, Gilbert Plains, Lundar, Sperling, and Cartwright. But no longer are fox towers required for breeding programs. The building, formerly situated on the north side of highway 67, immediately north of its present location, is now a municipally-designated historic site. It is part of a family-owned berry farm and recreational enterprise. Langtry Fox Farm Tower, NW 28-13-2E, Stonewall area, Manitoba Historic Resources Branch. We thank the Boonstra family for providing additional information used here.